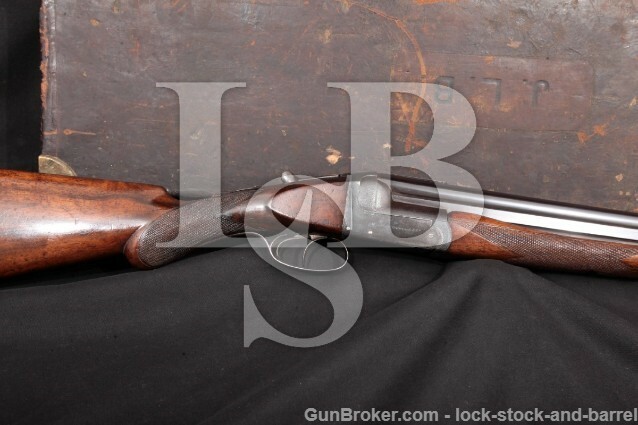 You are here > Home / Sold Fine European Arms / Westley Richards Ovundo, Blue 28″ Boxlock O/U C&R Over-Under Double Shotgun & Case, 1913-1937 12 GA.
Markings: The top of the top barrel is marked “WESTLEY RICHARDS & Co. LONDON.”, there is a short, solid rib over the chamber marked “”OVUNDO””. The left of the rib between the barrels is marked “OVUNDO SYSTEM REGD No 354045/1913”. The bottom of each of the barrels’ shoulders is marked with “NITRO PROOF 1 1/8”, “12 / C” in diamond, crown over “BV”, crown over “BP”, “12” and “NP”, the bottom of the right shoulder is also marked “CHOKE”. The bottom of the bottom barrel between the forend and barrel lugs is marked “T8540”. Each side of the water table is marked with a crown over “BV” proof. Each side of the receiver is marked “WESTLEY RICHARDS & Co.”. The bottom tang is marked “T8540”. Sights / Optics: This shotgun is mounted with a brass bead at the muzzle. Weight: 6 lb., 5.4 oz. Bore Condition: The bores are mostly bright. There is a small patch of extremely light erosion on the bottom of the bottom bore about mid-way through. Overall Condition: This shotgun retains about 95% of its current metal finish. The finish is thinning at most edges. The barrels have a few scattered light marks. The surfaces of the receiver and guard have scattered light freckling, moreso on the bottom of the receiver and the trigger guard. The bottom tang has handling wear and light surface oxidation. There is light operational wear on the top tang from the safety/selector and lever. The lever and safety have light wear from use and some light freckling. The screw heads range from sharp to tool marked with strong slots. The markings are clear. Overall, this shotgun rates in about Very Good condition. Mechanics: The action functions correctly. The barrels lock up to the receiver with no play. We have not fired this shotgun. As with all used firearms, a thorough cleaning may be necessary to meet your maintenance standards. Box, Paperwork & Accessories: This shotgun comes in a leather-bound hard-sided carry case with brass bolsters at the corners and latch. The lid of the case is marked “J. L. B.”. The case has heavy wear with fraying at edges and corners, two bolsters missing from the lid corners and one of the handle mounts starting to tear. Overall, the case is in about Fair-plus condition. Our Assessment: Westley Richards has more than two centuries of experience building fine firearms, a tradition which continues to this day. This example is their Ovundo System, an early over/under double design which Richards produced from 1913 to 1937. The gun is in about Very Good condition with 95% of its metal refinish, light wear in the metal and stocks and nice bores for a gun which clearly saw some use in the field. The gun is fairly light at 6 lb, 5.4 oz with barrels choked Cylinder Bore over Full. A Westley Richards would make an excellent addition to any collection, but the Ovundo is Westley Richard’s first over/under and was produced in multiple different styles, making this quite collectible as well as a model of which the collector may want different versions. Please see our photos and good luck! Over-Under Double Shotgun & Case, 1913-1937 12 GA.